codes worked good. Am saving up for a free bag of cat food. Thank you so much. I don’t have so much to go now. Got my water bottle! Thanks so much. 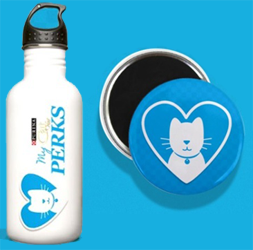 My cats have special diets and don’t eat this kind of food, but it’s great to have a kitty water bottle now! it keeps telling me that the 8 character mfg. code is invalid (both of them). does anyone know if there are perks for dog chow? Got a free airtight container and a free food scoop! Thanks so much I got the airtight container! it says I unlocked the reward & click to the rewards page to claim it. But when I click on the rewards page the food container is still locked. Hi Joyce, to get it click the reward and enter this “target code” 17800-14500 and that will unlock the reward for you. I’m having the same problem. I put in all the codes posted…it says the code is invalid. I must have missed it. The people who are having the problem that says the codes are invalid are not entering them correctly. I had this problem also, It was because when I copied and pasted the UPC I would often copy it with a space at the end of the last letter. Even though there is no number in that spot, It is acting like there is a number. When you copy make sure you only copy the exact amount of numbers. type in your code, say the code is 17800-15088 and hit enter. It will accept the code and then you can enter that same EXACT code again So i would enter 17800-15088 Again and hit enter and It will accept it. So each code can be entered twice. I hope this helps. Where do I enter the codes? What do I click to get to it. Well, it went through (again). It said “click over to the rewards page to redeem your offer”. When I click on rewards page it says the item is locked. Yay…got the airtight container. It will arrive in 4-6 weeks! at times I buy canned Fancy Feast for Kittens. can I turn the UPC code and get points for the cans? does anyone know the code for the kitty kong? I am having trouble logging in. I have forgotten my password. I have a lot of codes. i would like to use your air tight container.